Received March 15, 2018; Accepted September 27, 2018.; Published online November 14, 2018. The developmentally regulated GTP binding protein 2 (DRG2) is involved in the control of cell growth and differentiation. Here, we demonstrate that DRG2 regulates microtubule dynamics in HeLa cells. Analysis of live imaging of the plus-ends of microtubules with EB1-EGFP showed that DRG2 deficiency (shDRG2) significantly reduced the growth rate of HeLa cells. Depletion of DRG2 increased ‘slow and long-lived’ subpopulations, but decreased ‘fast and short-lived’ subpopulations of microtubules. Microtubule polymerization inhibitor exhibited a reduced response in shDRG2 cells. Using immunoprecipitation, we show that DRG2 interacts with tau, which regulates microtubule polymerization. Collectively, these data demonstrate that DRG2 may aid in affecting microtubule dynamics in HeLa cells. Microtubule structures are essential for cell division, cell shape, migration, secretary processes and vascularization. Microtubule dynamic instability arises via the regulated association and disassociation events of individual tubulin dimers from microtubule ends and is linked to GTP hydrolysis (Nogales and Wang, 2006). Their dynamics are generally classified according to four parameters: the rates of growth and shortening and the frequencies of switching between these phases, referred to as catastrophes and rescues (Desai and Mitchison, 1997). In a catastrophe event, microtubule growth stops and transitions into an explosive shrinkage phase in which proto-filaments peel off from the microtubule plus-end (Akhmanova and Steinmetz, 2008). In a rescue event, a microtubule ceases shrinking and reverts to a state of microtubule assembly. These growth and shrinkage states are accompanied by dynamic conformational changes in the structure of the microtubule plus-end. The observed shrinkage length before catastrophe was in the same range as previously reported for ‘comet lengths’ of the EB binding regions in cells (Seetapun et al., 2012). EB1 was suggested as a microtubule maturation factor and this provides a mechanistic explanation for its effects on microtubule growth and catastrophe frequency, which cause microtubules to be more dynamic (Maurer et al., 2014). There is a link between microtubule stability and the size of the EB binding region. When microtubules switch from growth to disassembly, the size of the EB binding region tends to decrease. The non-equilibrium polymerization of microtubules can be abruptly reversed by catastrophe, which releases GDP-tubulin (Mitchison and Kirschner, 1984). The exchange of GDP for GTP regenerates the rescue state, and therefore plays an important role in the cellular regulation of microtubule dynamics. In cells, microtubules are usually organized with their minus-ends associated with the microtubule-organizing center (MTOC) near the nucleus, and radiate outward so that the plus-ends are near the periphery of the cell. As one prominent MTOC in animal cells, the centrosome consists of two centrioles with γ–tubulin, which is an essential component for microtubule formation. γ-Tubulin is considered to be the main microtubule nucleator. There is recent evidence that MTOCs also exist within cells at other locations including the ER, the cytoplasm and the Golgi apparatus (Luders and Stearns, 2007). DRGs are a novel class of evolutionarily conserved GTP-binding proteins that constitute two closely related proteins, DRG1 and DRG2 (Leipe et al., 2002; Schenker et al., 1994). Although conservation of DRGs suggests that they may play an essential role in the control of cell growth and differentiation, critical cellular functions of DRG2 have not been defined. DRG2 is a member of the GTPase superfamily that is involved in the control of cell growth and differentiation. DRG2 plays a critical role in control of the cell cycle and apoptosis in Jurkat T cells (Ko et al., 2004). Although we have previously demonstrated the importance of DRG2 in cell cycle arrest in the G2/M phase, it remains unclear just how it regulates mitosis (Jang et al., 2016; Song et al., 2004). While mechanistic analyses showed that DRG1 mainly localizes at mitotic spindles and may be involved in the organization and regulation of mitotic spindle checkpoint in dividing cells (Lu et al., 2016), it remains unknown whether DRG2 is a spindle-associated protein. A recent study revealed that DRG2 plays a role in the modulation of membrane tubule stability through an interaction with Rac1 (Mani et al., 2017). Rac1 appears to mediate endothelial cell polarization and directional migration by promoting regional differences in microtubule dynamics (Braun et al., 2014). A key mechanism used by cells to regulate microtubule dynamics is the regulation of microbtubule-associated proteins (MAPs). As one of the MAPs, tau shows an affinity for and binds to tubulin. It may bind to the exterior as well as interior microtubule surface, in the same binding site as paclitaxel, and consequently competes with this drug. During paclitaxel binding to a pocket in β-tubulin, on the microtubule’s inner surface, the microtubule depolymerization process is inhibited (Amos and Lowe, 1999). The binding with tau stabilizes microtubules in the same way as paclitaxel, but with greater reversibility. In this study, we examined the biochemical properties of DRG2 with respect to microtubule-associated activity. We used DRG2 knockdown in HeLa cells to determine how DRG2 is involved in microtubule dynamics. Stable DRG2 knockdown in HeLa cells was established by transfection of shRNA. Briefly, a MISSION® pLKO-empty vector and a vector encoding pLKO-shRNA against DRG2 (Sigma, USA) were transfected into HeLa cells with lipofectamine 2000 (Life Technology, USA) to create control cells (Control) and DRG2-deficient cells (shDRG2), respectively. Reduced levels of DRG2 were demonstrated in shDRG2 cells (Supplementary Fig. S1). Cells were maintained in DMEM supplemented with 10% fetal bovine serum, 100 U/ml penicillin-streptomycin solution and 1 μg/ml puromycin (Sigma) to select against non-transfected cells. The medium was changed every other day until resistant colonies could be identified. After antibiotic selection, cells were maintained under standard conditions without puromycin in a humidified atmosphere of 95% air/5% CO2 at 37°C. Cells were named HeLa Control and HeLa shDRG2, as described in a previous study (Jang et al., 2016). Cells were lysed in lysis buffer (Promega, USA) containing protease inhibitor and phosphatase inhibitor. The protein concentration was determined by BCA protein assay kit (Pierce, USA) using bovine serum albumin as standard. Protein samples (30 ug) were separated by 12% SDS-polyacrylamide gels and transferred to PVDF membranes (Pall Corporation, USA). The membranes were blocked with TBS-Tween 20 containing 5% non-fat milk for 1 h at room temperature and probed overnight at 4°C with the following antibodies (Ab): DRG2 (14743-1-AP; Protein Tech) at 1:2500 dilution; α-Tubulin (DM1A; sc-32293, Santa Cruz Biotechnology) at 1:4000. Incubation with secondary antibodies was performed for 1 h at room temperature with 1:5000 goat anti-mouse IgG-HRP (sc-2005, Santa Cruz Biotechnology), in TBS-Tween 20/ 5% non-fat milk. Chemiluminescent signals were detected using Supersignal West Pico Chemiluminescent Substrate (Thermo Fisher Scientific Inc, USA). Protein quantification was performed by scanning immunoblots with the ImageQuant LAS 4000 (GE Healthcare Life Science) and analyzed by Image J software 1.42q (NIH, USA). HeLa cells were seeded on glass coverslips coated with poly-D-lysine (Neuvitro) in 35 mm cell culture dish at a density 0.3 × 105 cells/ml and grown for 24 h. With microtubule inhibitor experiments, the cells were treated with two different concentrations of paclitaxel (20 and 50 nM) (Sigma-Aldrich), 500 nM nocodazole (Sigma-Aldrich), 100 nM vinblastine (Sigma-Aldrich), 1 μM colchicine (Sigma-Aldrich) and incubated for an additional 1 h. Then cells were fixed with 4% paraformaldehyde (Sigma-Aldrich) for 20 min at room temperature and permeabilized for 4 min with 0.1% Triston-X-100/ PBS, washed three times with PBS in 10 min. The samples were treated with 5% normal goat serum (NGS) for 1 h at room temperature and incubated over night at 4°C with diluted 1:500 α-Tubulin (DM1A) mouse monoclonal IgG1. After washing three times with PBS, samples were incubated with 1:1000 Alexa Fluor™ 594 goat-anti mouse, in 5%NGS/PBS for 1 h at room temperature. The coverslips were mounted with DAPI and examined with confocal microscope (Olympus FV2000). Cells were transfected at 60–70% confluence and cultured at 37°C in a humidified atmosphere with 5%CO2. Transfection was performed with Lipofectamine 3000 (Invitrogen) according to the manufacturer’s instructions using pEB1-2xEGFP plasmid (#37827, Addgene). p3XFLAG-hDRG2-resistant plasmid was used to rescue DRG2 in shDRG2 cells. After seeding the cells in 6-well cell culture plate, p3XFLAG and p3XFLAG-hDRG2-resist plasmid DNA were transfected using Lipofectamine 3000 according to manufacturer’s instruction. Next day, cells were harvested for western blot analysis and flow cytometry. HeLa cells were plated on glass coverslips with poly-D-lysine coating (Neuvitro) in 35 mm cell culture dish with pEB1-2xEGFP transfection. The cells were imaged in 2D to measure the dynamicity of microtubules ends labeled with pEB1-2xEGFP. Cells were continuously imaged in a 37°C, 5% CO2 chamber. Images were acquired every 0.1 s for a total of 1 min for each time-lapse movie. All image analysis was performed using plusTipTracker program (Applegate et al., 2011). Confocal images were acquired in sequential mode using a 100× Plan Apochromat NA/1.4 oil objective and the appropriate filter combination on an Olympus 2000 laser-scanning confocal system. All images were saved as TIFF files, and contrast adjusted with Image J (vl.19 m). Live cells images were acquired at 37°C every 20 or 30 sec. Videos were also generated with Image J program. Cells washed with ice-cold PBS were lysed in RIPA buffer supplemented with protease and phosphatase inhibitor cocktail (Roche). Cell lysates were incubated on ice for 30 min and then were centrifuged at 16,000 × g for 10 min at 4°C. For immunoprecipitation, the whole cell lysates were incubated with 1 μg/ml of anti-GFP antibody for 2 h and Dynabeads Protein G (Life Technologies, 10003D) for 4 h at 4°C. The immunoprecipitates were collected, washed three times with lysis buffer, and proteins were eluted with Laemmli sample buffer. Experiments were repeated three times in each case. GraphPad Prism5 (GraphPad Software, Inc., USA) was used to perform statistical tests and graphing. The Student’s t-test was used and ‘*’ in bar graphs indicate statistically significant p-values; *p < 0.05; **p < 0.01 and ***p < 0.001. Error bars represent the standard error of the mean in every case (SEM). To characterize the role of DRG2 in microtubule dynamics, we examined the plus-ends of microtubules in DRG2 knockdown HeLa cells (shDRG2) after transfection of EB1-EGFP. The exponential decay of available binding sites for EB1 results in the characteristic comet-like fluorescence profiles of EGFP-tagged EB on microtubule ends. We used plusTip-Tracker program to measure the proportion of each subpopulation representing ‘slow and long- lived’, ‘fast and long-lived’, ‘slow and short-lived’, and ‘fast and short-lived’ growth events and growth sub-tracks extracted from the sub-ROI (region of interest). Monitoring the plus-end microtubule-tracking protein EB-1 revealed that the shDRG2 cells exhibited an increase in the ‘slow and long-lived’ subpopulation, but decreased ‘fast and short-lived’ subpopulation, when compared to the control cells (Figs. 1A and 1B). Both the growth speed distribution of EB1-GFP and average growth speed, indicated that DRG2 depletion impairs the growth of microtubules (Fig. 1C). When we measured microtubule nucleation events, we found they were also decreased in shDRG2 cells (Fig. 1D). MTOC was clearly found in control cells, while intact MTOC was impaired in shDRG2 cells. Taken together these data indicate that DRG2 is involved in controlling microtubule polymerization. Furthermore, rescue experiments showed that this resistance of shDRG2 cells was reversible by transfection of the p3XFLAG-hDRG2-resist construct (Supplementary Fig. S2). Knockdown of DRG2 caused a failure of microtubule depolymerization in the presence of microtubule inhibitors. Paclitaxel, which stabilizes the microtubule polymer and protects it from disassembly, abolished microtubule structure in control cells, but not much in shDRG2 cells. 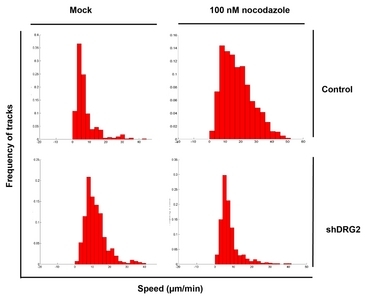 Immnunohistochemical assay using an anti-α-tubulin antibody showed that most microtubules remain unchanged in the shDRG2 cells, while microtubules were almost broken down in HeLa control cells after treatment with 50 nM paclitaxel (Fig. 2A). Microtubules were destroyed in approximately 80% of control cells by paclitaxel treatment, while 40% of shDRG2 cells contained depolymerized microtubules (Fig. 2B), suggesting that DRG2 deficient cells are resistant to paclitaxel-mediated microtubule stabilization. We examined whether DRG2 depletion interferes with the effect of other antimicrotubule agents. While both vinblastine and colchicine treatment induced severe impairment of microtubule formation in control cells, DRG2 deficient cells showed considerable resistance to these agents (Figs. 2C–2F) Upon treatment with 100 nM nocodazole, the growth speed of EB1 comets was significantly changed in control cells but not in shDRG2 cells (Fig. 3). This result further suggests that DRG2 depletion can provide resistance against antimicrotubule agents in HeLa cells. Because tau protein can bind to tubulin at the same site as paclitaxel and enhance microtubule assembly, we addressed the possibility that DRG2 may interact with tau as a mechanism for regulating microtubule dynamics. Immunoprecipitation/western blot assay showed that wild type tau binds to DRG2 in HeLa cells (Fig. 4A). Treatment of nocodazole, however, did not affect the interaction between tau and DRG2 (Supplementary Fig. S3). In shDRG2 cells, p-tau S202 was significantly increased as compared to control cells (Fig. 4B). DRG2 is a member of a novel class of evolutionarily conserved GTP-binding proteins which constitute a subfamily of the GTPase superfamily (Schenker et al., 1994). A recent study showed that DRG2 coordinates Rab5 activity on endosomes and in transferrin recycling (Mani et al., 2016). Rab5 stimulates motility of early endosomes on the microtubule. However, further work is necessary to elucidate the mechanisms by which the endosomal compartment on microtubules are regulated by DRG2. In this study, we analyzed microtubule dynamics by tracking EB1 as a marker for microtubule plus-ends in DRG2-deficient cells. Growth speed of EB1 comets dramatically decreased in shDRG2 cells. Microtubules stochastically switch between phases of growth and shrinkage. This non-equilibrium polymerization behavior has been known as microtubule dynamic instability (Mitchison and Kirschner, 1984). It results from different structural states of the microtubule ends by polymerization-coupled GTP hydrolysis (Nogales and Wang, 2006). Microtubule growth is thought to be accompanied by a protective cap of GTP-loaded tubulin at the growing microtubule plus-ends. Together, these data suggest that DRG2 may regulate microtubule stability through GTP hydrolysis of tubulin on the microtubule plus-ends. Microtubule dynamics have been investigated extensively by time-lapse imaging of fluorescently labeled proteins in live cells (Frigault et al., 2009). Polymerization of microtubule occurs through two crucial steps, nucleation and elongation. In shDRG2 cells, the number of nucleation events appears to be less than in control cells. Drugs that target microtubules are thought to suppress microtubule dynamic instability. Microtubule inhibitors consist of two groups; vinblastine and colchicine destabilize microtubules, but paclitaxel can enhance microtubule stability. In our study, both types of microtubule inhibitors showed little efficacy in the shDRG2 cells, thus indicating a change of microtubule instability. Subtoxic drug concentrations are sufficient to inhibit plus-end microtubule dynamic instability, while the higher drug concentration generates microtubule fragments by stimulating microtubule minus-end detachment from their MTOCs, although the mechanism by which microtubules detach from centrosomes is not known (Yang et al., 2010). This study demonstrates that DRG2 depletion switches ‘fast and short-lived’ subpopulations to ‘slow and long-lived’ subpopulations at microtubule plus-ends, suggesting that microtubules are very stable in the shDRG2 cells and that DRG2 is required for regulating microtubule dynamic instability at both ends. Recent data from our lab has indicated that DRG2 functions are linked to GSK3β activation (unpublished). GSK3β directly phosphorylates tau on S202 (Li and Paudel, 2006). According to our current results, DRG2 would lead to reductions in p-tau. Our immunoprecipitation data also indicated a direct interaction between DRG2 and tau protein. S202 in tau is located in a proline-rich region, and when phosphorylated, is known to affect tau functions, including tau interactions with phosphatases and tau filament formation (Rankin et al., 2005). Therefore, our findings suggest that binding of DRG2 to tau may induce dephosphorylation of tau on S202 and consequently regulate microtubule stability. 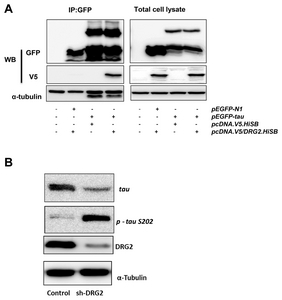 However, it remains unknown whether phosphorylation of tau is associated with the resistance exhibited by DRG2 against microtubule inhibitors. In conclusion, the findings from this study demonstrate that DRG2 depletion abolishes normal microtubule dynamics, which might be regulated through phsophorylation of tau in HeLa cells. This study is the first to reveal a functional role for DRG2 in tau-associated microtubule polymerization and stabilization. Fig. 1. Cells were transfected with EB1-EGFP construct and EB1 was imaged by tracking EGFP fluorescence. Microtubule subpopulations were classified by growth speed and growth lifetime in HeLa cells. We used the ‘Quadrant Scatter Plot’ tool of plusTipTracker (). (A) Four subpopulations of growth sub-tracks are imaged by 4 different colors; ‘slow and long-lived’ (green), ‘fast and long-lived’ (blue), ‘slow and short-lived’ (red), and ‘fast and short-lived’ (yellow). (B) Relative proportions of the subpopulations in different subcellular regions, (C and D) Quantitative analysis of EB1-EGFP comet growth speed and number of nucleations in live cells. Fig. 2. (A, C, E) Images of microtubules in control cells and shDRG2 cells. Cells were treated with paclitaxel, vinblastine, or colchicine and images were visualized by immunofluorescent staining with the anti-α-tubulin antibody. (B, D, F) Percentage of cells that contains depolymerized microtubules after paclitaxel, vinblastine, or colchicine treatment. Data are the mean ± S.E. of three independent experiments (*P < 0.05, **P < 0.01, ***P < 0.001). Fig. 3. We measured growth speed of EB1-EGFP comet and displayed data as a histogram. Fig. 4. (A) Immunoprecipitation/western blot assay was performed from extracts of HeLa cells transfected with pEGFP-tau and pcDNA. V5/DRG2.HiSB. For controls, cells were transfected with either pEGFP-N1 or pcDNA.V5.HiSB. (B) Western blot assay was performed with specific antibodies against phospho-tau (p -tau) S202. Akhmanova, A., and Steinmetz, M.O. (2008). Tracking the ends: a dynamic protein network controls the fate of microtubule tips. Nat Rev Mol Cell Biol. 9, 309-322. Amos, L.A., and Lowe, J. (1999). How taxol stabilises microtubule structure. Chem Biol. 6, R65-9. Applegate, K.T., Besson, S., Matov, A., Bagonis, M.H., Jaqaman, K., and Danuser, G. (2011). plusTipTracker: Quantitative image analysis software for the measurement of microtubule dynamics. J Struct Biol. 176, 168-184. Braun, A., Dang, K., Buslig, F., Baird, M.A., Davidson, M.W., Waterman, C.M., and Myers, K.A. (2014). Rac1 and aurora a regulate MCAK to polarize microtubule growth in migrating endothelial cells. J Cell Biol. 206, 97-112. Desai, A., and Mitchison, T.J. (1997). Microtubule polymerization dynamics. Annu Rev Cell Dev Biol. 13, 83-117. Frigault, M.M., Lacoste, J., Swift, J.L., and Brown, C.M. (2009). Live-cell microscopy - tips and tools. J Cell Sci. 122, 753-767. Jang, S.H., Kim, A.R., Park, N.H., Park, J.W., and Han, I.S. (2016). DRG2 regulates G2/M progression via the cyclin B1-Cdk1 complex. Mol Cells. 39, 699-704. Ko, M.S., Lee, U.H., Kim, S.I., Kim, H.J., Park, J.J., Cha, S.J., Kim, S.B., Song, H., Chung, D.K., and Han, I.S. (2004). Overexpression of DRG2 suppresses the growth of Jurkat T cells but does not induce apoptosis. Arch Biochem Biophys. 422, 137-144. Leipe, D.D., Wolf, Y.I., Koonin, E.V., and Aravind, L. (2002). Classification and evolution of P-loop GTPases and related ATPases. J Mol Biol. 317, 41-72. Li, T., and Paudel, H.K. (2006). Glycogen synthase kinase 3beta phosphorylates Alzheimer’s disease-specific Ser396 of microtubule-associated protein tau by a sequential mechanism. Biochemistry. 45, 3125-3133. Lu, L., Lv, Y., Dong, J., Hu, S., and Peng, R. (2016). DRG1 is a potential oncogene in lung adenocarcinoma and promotes tumor progression via spindle checkpoint signaling regulation. Oncotarget. 7, 72795-72806. Luders, J., and Stearns, T. (2007). Microtubule-organizing centres: a re-evaluation. Nat Rev Mol Cell Biol. 8, 161-167. Mani, M., Lee, U.H., Yoon, N.A., Kim, H.J., Ko, M.S., Seol, W., Joe, Y., Chung, H.T., Lee, B.J., and Moon, C.H. (2016). Developmentally regulated GTP-binding protein 2 coordinates Rab5 activity and transferrin recycling. Mol Biol Cell. 27, 334-348. Mani, M., Lee, U.H., Yoon, N.A., Yoon, E.H., Lee, B.J., Cho, W.J., and Park, J.W. (2017). Developmentally regulated GTP-binding protein 2 is required for stabilization of Rac1-positive membrane tubules. Biochem Biophys Res Commun. 493, 758-764. Maurer, S.P., Cade, N.I., Bohner, G., Gustafsson, N., Boutant, E., and Surrey, T. (2014). EB1 accelerates two conformational transitions important for microtubule maturation and dynamics. Curr Biol. 24, 372-384. Mitchison, T., and Kirschner, M. (1984). Dynamic instability of microtubule growth. Nature. 312, 237-242. Nogales, E., and Wang, H.W. (2006). Structural intermediates in microtubule assembly and disassembly: how and why?. Curr Opin Cell Biol. 18, 179-184. Rankin, C.A., Sun, Q., and Gamblin, T.C. (2005). Pseudo-phosphorylation of tau at Ser202 and Thr205 affects tau filament formation. Brain Res Mol Brain Res. 138, 84-93. Schenker, T., Lach, C., Kessler, B., Calderara, S., and Trueb, B. (1994). A novel GTP-binding protein which is selectively repressed in SV40 transformed fibroblasts. J Biol Chem. 269, 25447-25453. Seetapun, D., Castle, B.T., McIntyre, A.J., Tran, P.T., and Odde, D.J. (2012). Estimating the microtubule GTP cap size in vivo. Curr Biol. 22, 1681-1687. Song, H., Kim, S.I., Ko, M.S., Kim, H.J., Heo, J.C., Lee, H.J., Lee, H.S., Han, I.S., Kwack, K., and Park, J.W. (2004). Overexpression of DRG2 increases G2/M phase cells and decreases sensitivity to nocodazole-induced apoptosis. J Biochem. 135, 331-335. Yang, H., Ganguly, A., and Cabral, F. (2010). Inhibition of cell migration and cell division correlates with distinct effects of microtubule inhibiting drugs. J Biol Chem. 285, 32242-32250.